World Cup winners Australia have named an initial 21-strong training squad for the autumn Four Nations series. The group is drawn from the bottom eight NRL clubs that missed out on the play-offs but includes 14 players called up for the 2014 State of Origin. 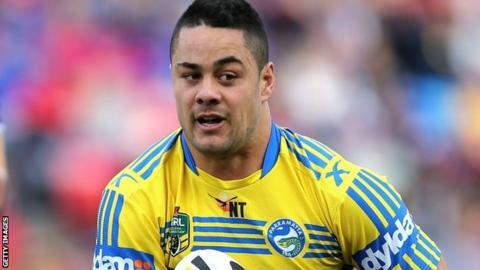 Parramatta Eels full-back Jarryd Hayne, one of the main contenders for the Dally M Player of the Year award, is among the call-ups to Tim Sheens' pool. Veteran prop Willie Mason is also named in the squad at the age of 34. Four players without Test experience - Anthony Milford, Jarrod Croker, Jack Wighton and Aidan Sezer - are also in the squad, which will be added to once the NRL play-offs are completed. Sheens' most notable omission is Cronulla lock Paul Gallen, who is ineligible through suspension following the ASADA doping agreement. The tournament begins on 25 October with a double-header in Brisbane, with Australia facing New Zealand in a repeat of last year's World Cup final and England taking on Samoa. Australia squad: Brett Morris, Josh Dugan, Trent Merrin (St George-Illawarra), Jarryd Hayne, Will Hopoate (Parramatta Eels), Beau Scott, Kurt Gidley, Willie Mason (Newcastle Knights), Anthony Milford, Jack Wighton, Jarrod Croker, Josh Papalii (Canberra Raiders), Andrew Fifita, Luke Lewis, Michael Gordon (Cronulla Sharks), Aaron Woods, Robbie Farah (Wests Tigers), Aidan Sezer, Dave Taylor, Greg Bird (Titans), Jacob Lillyman (NZ Warriors).